Nowadays, the Maronite Antonine Order includes thirty monasteries and Missions in Italy, France, Belgium, Canada, Australia, Syria and Turkey. The educational action of the Antonine Order developed during the last fifty years, which was implemented in two ways of educational action. The first order: private and paying at the school of the Antonine Fathers in Baabda. The second: one private and gratuitous in eight Antonine monastery schools and centers in various regions of Lebanon. The total number of students enrolled reached 1380 for the academic school year 1968-1969. These schools, which relieve the parents of important financial burdens, offer a high level of instruction and culture, as attested by the results of the official examinations, while in the same time granting the educators a large scope of action in order to exercise the desired spiritual and moral mission, all the more because our society is very demanding towards monks. Besides, there were several attempts to establish specialized branches in high studies, such as the College of Law and Theology in Baabda, College of General and Dental Medicine, and the College of Engineering. Unfortunately, these closed because of political and competitive social conflicts. During the last war in Lebanon (1975 onwards), many schools stopped their operations and some of them turned into private non-gratuitous schools, such as Mar Roukoz in Haouch Hala, Our Lady of El Mina and the College of the Antonine Fathers in Baabda. The Order also established a secondary school in Hasroun, a primary and complementary school in Talabaya, and a primary/middle school in Ajaltoun. In these schools new branches of cultural, professional and technical nature were created; such as the institute of dental prothesis, the institute of dental assistants, the Jean-Paul II technical institute in Jezzine, another one in Qlayia (Marjeyoun) and the university branches in Baabda, Mar Roukoz Dahr El Houssayn and in Zahle. Facing such a number of pupils and students, and even families, we feel, as Antonine Monks, committed to the realization of the main objectives of education. The education of youth in order to direct them toward a human and Christian maturity. In this context, Saint John Chrysostomos says: “Watch the youth carefully every day, and make them heroes of the Christ”. Education for all, without distinction of religion, race or color. This education is a vested right for pupils, as it is part of the core of their human vocation, which helps them to enjoy the dignity proper to man. 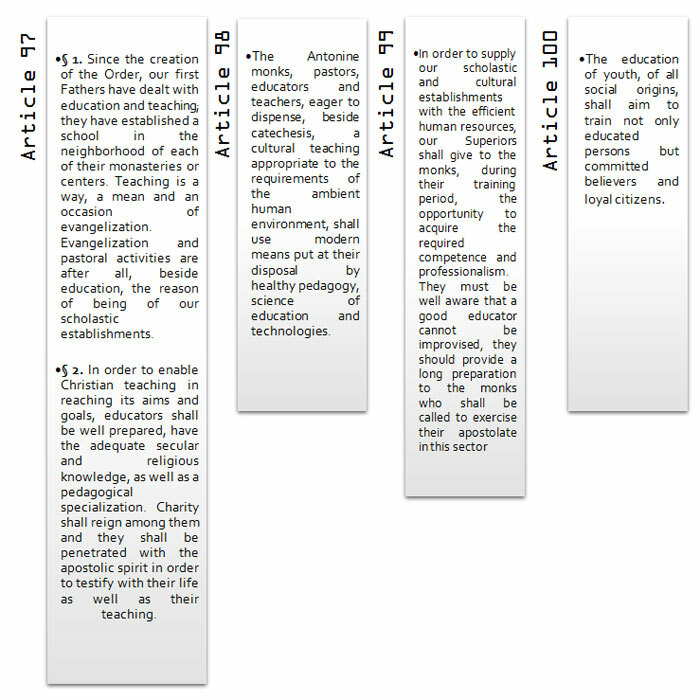 Education based on freedom, according to our commitment to provide the freedom of education recognized by the Lebanese Constitution as mentioned by His Holiness the Pope Jean-Paul II in his apostolic exhortation “Familiaris consortio” Nº16 which states “that the right for the parents to choose an education according to their faith shall be absolutely guaranteed. States shall provide the necessary assistance to the families in order to properly assume their educational mission…”. The attendance to youth during the training period in order to educate the Man who lies in them, and contribute to magnify every man. The school of our Order does not make any distinction between social classes, it aims to develop the personality of each pupil and promote his spiritual, moral and social life, in accordance with the evangelical principles that guide our educational action. Our Antonine School does not attend only to the intellectual and practical guidance; it also seeks to make the school campus an intimate meeting point between parents, educators and pupils, enhancing links between the members of the “educational family”, in order to allow the student to live his moral, intellectual and human development with the appropriate equilibrium. Our Antonine School seeks to educate men and women of the rising generations in order to prepare them to be citizens of the future, capable of giving their utmost to the society and to the Church. It is therefore necessary to educate our youth with a sense of responsibility. We are responsible for the success of the generations that we educate in their missions and their future responsibilities. Besides the eagerness of our schools to provide a high level instruction, we are able to provide the adequate moral and spiritual education in each human being and act as witnesses of the Christ, source and center of all life. Beside intellectual instruction, our duty is to educate the conscience and develop the spiritual life with the practice of virtue, devotion to social life which opens to the world. This major education is the path to the development and to the liberation of man and people, to solidarity and brotherly comprehension, to Christ and to the Church. This valued education is the big challenge confronted by the educational family in our modern world. Instruction is inseparable from teaching the essential, which is truth and human dignity, these values taught by the Christ and whose source and aim lie in God. This is how the rising generation discovers the sense of its existence and perceives its vocation in order to express hope in the world. Evangelical: As it seeks the means to help the youth to make a good “reading” of the words of God. Christian: Our first concern is to be at the service of the Church in the accomplishment of its mission. Spiritual: Act to promote the spiritual life of our pupils with the practice of Christian virtue, such as life in community, love of God and of the others, respect of the others and solidarity with each and every man. This work is provided by the presence and action of the monks, in collaboration with laymen of good will prepared “ad hoc”. Civic: Our presence in Lebanon as well as the diversity of our pupils urges us to make our country a meeting point for all Lebanese families. Indeed, the Synod for Lebanon recommends that we live and preach conviviality while emphasizing on the inter-religious dialogue, loyalty towards our home country and opening on all societies. Human: Our educational mission urges us to educate children to human values in order to acquire the sufficient maturity on this ground enabling a healthy development of spiritual and intellectual powers.